All around the world renewable energies are high up on the agenda when it comes to setting goals for energy policy and environmental protection. Harvesting energy from wind plays a major role in this context. Its share has multiplied in the last few years. 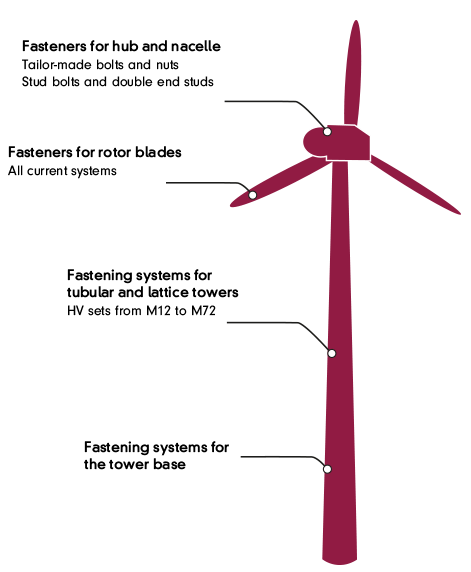 Single wind mills have assembled to form whole wind power plants in smaller and bigger wind farms. Sometimes these complex and technically demanding installations have to cope with extreme natural conditions. First and foremost, it is due to technically superior and highly developed quality fasteners that they are able to withstand the forces of nature and resist the elements. The major manufacturers of wind power generators therefore trust in connection components from AUGUST FRIEDBERG – the global player for “wind bolts” and fastening systems.